From national best-selling author Robin R. Speziale - learn how to make money investing in growth stocks. 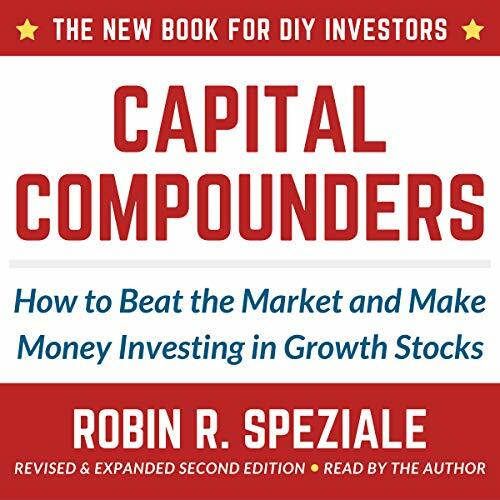 In Capital Compounders, DIY investor and national best-selling author Robin R. Speziale makes it easy for anyone to beat the market and make money investing in growth stocks! Robin R. Speziale shares his journey building a $300,000+ stock portfolio before 30 (and how you can, too!) by investing in growth stocks or “Capital Compounders” - stocks that double, and then double again, and again on the market. Capital compounder stocks have achieved the “tenbagger” (one dollar turns into $10), and some even the “100-bagger” (one dollar turns into $100) status. Mr. Speziale discusses the commonalities of today’s market-beating growth stocks so you can find the next ones in the future. Capital Compounders is for both budding and seasoned investors. It’s entertaining (because finance can be dry) and includes lots of easy-to-learn tips and strategies on growth investing that you can apply in the stock market. Robin R. Speziale is a DIY investor and Globe and Mail national best-selling author of Market Masters (2016). He's been investing in the stock market since 2005 and built a $300,000+ portfolio before 30. Mr. Speziale lives in Toronto, Ontario. This is a time tested way to make money in stocks. There are many ways to make money in the stock market. Finding a way that works for you and allows you to sleep at night is the most difficult. Robin's book is all about the way he makes his stock selections. Robin wants long term growth at a reasonable price. After listening to the audio book I am fairly certain that you will go back and look at your investments with a slightly different light. It appears that Robin is very well read as many of his methods have been acquired over time from some of the best minds on wall street. I think the book could be a little more organized and a professional reader would make the listening experience a little easier. I have to tip my hat to Robin as I personally like self starters that are aggressive. Listening to Robin read his book you can tell that he is passionate about the stock market and what he is doing. I think all investors should read Speziale's book just like they should read Schwager, Lefevre, Buffet, Graham, Dalio, and Piketty to name a few. Finding a way to make money in stocks is usually learned from adapting ideas from other successful investors.